Experts respond to UK report declaring Brotherhood as a terror backer, say it shows how Obama turns a blind eye to radical Islam. Experts say the official UK report released this week following an 18-month study, which declares the Muslim Brotherhood to be openly supportive of terror, clearly expresses just how out of touch US President Barack Obama's approach to the extremist group has been. The investigation was ordered by Prime Minister David Cameron back in April 2014, and this week he shared some of the findings of the classified report. Among other things, it found that supporting the Hamas terror group in Gaza is a key priority for the Brotherhood - Hamas is a Gazan offshoot of the Islamist organization. While the Brotherhood has allegedly renounced violence on several occasions, the report notes senior figures repeatedly supported Hamas terror attacks, and justified attacks in Afghanistan and the US. While the Brotherhood generally follows non-violent methods for expediency, “they are prepared to countenance violence – including, from time to time, terrorism – where gradualism is ineffective," the report found. "I think the report is a damning indictment of the Muslim Brotherhood, and it’s a very realistic assessment of the nature of the Brotherhood itself,” Nile Gardiner, director of the Heritage Foundation's Margaret Thatcher Center for Freedom, told Fox News on Thursday. Gardiner added that the report undoubtedly "will embarrass the Obama administration because the White House has gone out of its way to try to appease the Muslim Brotherhood, and so this report I think dramatically undercuts the Obama presidency’s weak-kneed approach on this matter." 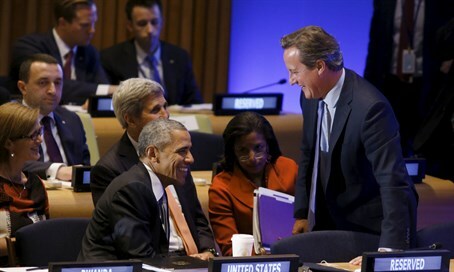 "Obama doesn't understand threat of radical Islam"
Cameron said following the report that association with the Brotherhood "should be considered as a possible indicator of extremism," noting the UK will refuse visas of those with ties to the group who made radical comments, and will continue to consider banning the Brotherhood. The comments indicate a shift in recognition, after the West generally backed the rise of the Muslim Brotherhood under Egyptian President Mohammed Morsi following the 2011 "Arab Spring." A military coup saw Morsi's government fall, and the new Egyptian government named the Brotherhood as a terrorist organization in December 2013. But Obama has largely kept his position of support for the group, given most visible expression in his infamous 2009 Cairo speech shortly after being elected, when he invited members of the Muslim Brotherhood. Just this January, the US State Department met with members of the Egyptian Freedom and Justice Party, which was established by the Brotherhood. Obama's position was also shared by his former Secretary of State Hillary Clinton, who in 2011 when asked if the US should fear the Brotherhood said "the jury is out." Ryan Mauro, national security analyst at The Clarion Project, told Fox News that "the Muslim Brotherhood plays word games, they know how to pretend to be moderate." "If the Obama administration is saying the Muslim Brotherhood is non-violent and democratic then they do not understand the Muslim Brotherhood and do not understand the overall threat of radical Islam." According to Mauro, former President George W. Bush's administration did not fully grasp the threat either, and the difference in approach with Europe could cause problems down the line. “We’ve already been seeing this wedge between Europe and the US where our politically correct approach - where we describe the threat as generically violent extremism - is very different from what Europe has been talking about, about striking at the ideology,” Mauro said.